Make sure what you’re offering is easy to understand. Demonstrate that what you’re offering is true. Make sure it’s easy and as risk-free as possible to accept your offer. So, how do we apply these fundamentals to any website as part of a Conversion Rate Optimisation project? It’s often easier to start CRO projects by focusing on the third fundamental, making it easier and less risky for visitors to accept your offer. We often talk about how well a website or landing page converts, but of course, it’s not our pages, but our visitors that are converting! We’re not actually optimising web pages, but what our visitors are thinking. With this fundamental, we’re focusing on visitors who would have converted, but aren’t accepting our offer because they perceive the effort or risk to be too high. As A/B split-tests can take up to a month to provide a reliable result (i.e. reach statistical significance), it’s advisable to collect evidence that the problem you’re seeking to fix actually exists. Measuring the percentage of visitors that reach your form or checkout, but don’t start completing it. Identifying form fields with high ‘drop-off’ rates, where visitors stop completing your form. Comparing form completion rates of different visitor segments, such as those using mobiles compared to those using desktops (i.e. your form may appear excessive to visitors using mobiles, and not to those using desktops). Form field tracking can be made easier with tools such as Formisimo or HotJar. Evidence can be collected about visitors’ perception of excessive risk by asking them about their experience using an Exit Survey, a small pop-up box that appears when visitors are about to leave, such as those available from Qualaroo, WebEngage or HotJar. About 10% of visitors will respond, providing ‘voice of customer’ insights, explaining why visitors consider your site or offer to be untrustworthy. Why visitors should buy from you and not a rival. Evidence demonstrating that this is true. You can collect evidence as to whether visitors are having difficulty understanding your offer using a Five Second test, such as that provided by Usability Hub. This tool shows a web page to selected testers for five seconds, and then asks them questions. If 80% of respondents cannot accurately describe your website’s product or service, I recommend re-performing five second tests with revised pages until the 80% mark is achieved. You can then run an A/B split-test on your site using the successful version of the page. Expressing a clear reason why your target market should buy from you and not a rival is known as your Value Proposition. Provided that your Value Proposition is sustainable, unique and wanted by your market, you can express it throughout the traffic funnel, including your ads and form pages. This can provide three boosts to your traffic funnel, potentially significantly increasing your website’s conversion rate and overall financial performance. 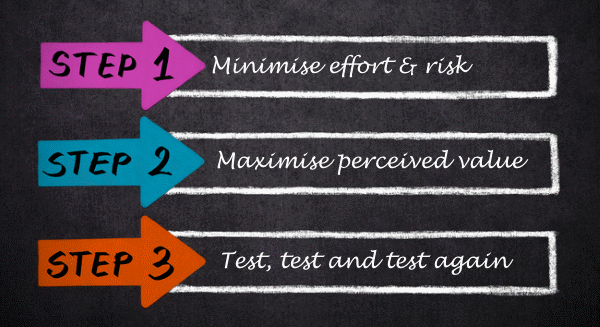 Once you’ve identified opportunities to improve your conversion rate and have collected supporting evidence for each opportunity, you need to prioritise your tests so that you’re focusing on those areas that can deliver the most additional profit. Then, you’re ready to proceed with A/B split testing, displaying different versions of a web page to your visitors and measuring which one results in a higher conversion rate. You don’t need to be a designer or developer to create updated versions of your pages as some split-testing tools have a WYSIWYG editor that lets you ‘drag and drop’ and add elements to a new page. Tools such as Optimizely, VWO and Google Optimize let you do this. This post was written by James Eckhardt who leads Emarketeers Conversation Rate Optimisation course.